The birthplace of Alexander Nevsky is famous for its monasteries and Lake Pleshcheyevo, making it a pleasant place for a day trip. Twenty years ago the town looked different: crooked little wooden houses everywhere - part town, part country, just one traffic light at the main crossroads, and a few little shops with half-empty shelves. Opposite the traffic lights was the Central Univermag (state supermarket), where compote was sold in three-litre jars. The jam sold out immediately, not because it tasted so good, but because of its glass containers, worth their weight in gold to housewives who used them for making their winter pickles. Now not a trace remains of the shop; an enormous area of new buildings and high-rise blocks has grown outside the town, some good-quality hotels have been built, and only the rampart, which traverses the whole of Pereslavl, still preserves its unique character and historic memories. Pereslavl has a peaceful, calming atmosphere: its inhabitants, never in a hurry, are happy to stop and chat for an hour or so to a neighbour. • The Lake is a product of the Ice Age; rough estimates make it more than thirty-thousand years old. Around sixteen species of fish are to be found in the lake. Of these, the best to eat is the vendace, popularly known as "the Tsar's herring" because it was served at the table of the Russian tsars. Vendace can be bought, smoked or salted, at the town's Sunday market. • The most fun thing about this enormous body of crystal-clear, fresh water is its depth near the shore. Going for a swim in the lake is not for the lazy; the lake is shallow for the first hundred yards. You can literally 'walk on water.' It is thanks to this that the lake has become so popular with novice wind-and kite-surfers - it is much easier, of course, to stand upright again if your feet are on the bottom than if you are floating on the surface of the water ... But be careful, the bottom changes abruptly, the weeds vanish and a strong current appears, concerning which many local legends have grown.... they say for instance, that there are both fish weighing over 100 pounds and mermaids (weighing a little more). • In winter, the main entertainments are ice fishing and, again, kite surfing. • It is prohibited to use motorboats on the lake so you can hire something more picturesque from the locals, for example a rowing boat or a water bicycle. • The bottom of the lake is covered with tiny fragments of shell, weeds grow here and there, and the water is so clear that with every step you can see shoals of tiny fishes scattering in fright in all directions. • Active sports lovers stay in the village of Veskovo, pitching their tents right on the shore or renting a chalet in the grounds of the kite school http://Surf-Point.ru/. The school offers equipment for hire and professional instruction. • Peter the Great's 'Little Boat' museum is situated almost at the entrance to the town. It was on the banks of Lake Pleshcheyevo that the Tsar defeated the so-called 'funny fleet', his training flotilla, and laid the foundations of Russian ship-building. Many treasures still survive today and you can spend an hour or two in the house and grounds of the 'Little Boat' museum - one of the provincial museums, which is worth a visit. 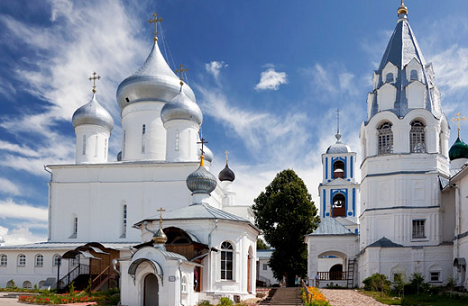 Pereslavl is the birthplace of Alexander Nevsky. The town itself was founded in 1152 by Prince Yuri Dolgoruki. To this day, Pereslavl is a town of contrasts. Lopsided old Russian peasant huts stand side-by-side with brand-new dachas belonging to Muscovites, and new buildings adjoin one-storey wooden structures. • The 11th century Nikitsky Monastery. Both Ivan the Terrible and Peter the Great spent time here. Next to the monastery is a bath-house with a spring which is worth particular attention, since according to popular belief, it brings health and long life. • The 14th century Svyato-Nilolsky Women's Monastery - the Most beautiful and snow-white monastery in the whole Region. • The Goritsky Monastery - a museum for the conservation of architecture and painting. You can climb the bell-tower for a panoramic view of the town or go round the old picture gallery. • The most important symbol of heathen Rus' - the 'Sin Kamen' or Blue Stone is situated on the opposite bank from Peter the Great's' Little Boat '. From time immemorial, numerous legends and beliefs have been linked with this enormous 12-ton boulder, said to have miraculous powers. Is there anything that hasn't been done to the Blue Stone: it has been moved from place to place, it has been buried, it even sank to the bottom of the lake, but mysteriously reappeared on dry land.... Now the Blue Stone is disappearing further and further into the ground and tourists are hurrying to break off little pieces 'for luck'. • Travelling along the road towards Peter's Little Boat, you might get the impression that Pereslavl-Zalesky is the 'museum town' per se. What kind of museum will you not find along the road: a museum of radio, a museum of teapots, a museum of ironing, a museum of steam engines, a museum of money, a museum of wit and cunning, it's all serious and lucrative antiquarian business. • In the 'Little Boat' museum you can buy a newly minted coin; a few strokes by a craftsman with a special tool and your coin is made. • Near the 'Blue Stone' there is a 'parade' of local craftspeople. They sell goods made of pottery and birch bark, as well as various amulets and charms at very affordable prices. • At the municipal market they sell freshly-gathered mushrooms in season. In these parts, mushroom gatherers are spoiled by the abundance and variety of the harvest.